The Bishop of Jaffna and the priests belonging to the diocese expressed profound sadness at the loss of Joseph Pararajasingham and said the act was unjustifiable and unacceptable to men of good-will. "Perpetrators of this inhuman act will, one day, stand trial in the presence of the creator," Bishop of Jaffna Thomas Soundaranaygam said in his message. "We are deeply shocked and grieved at the unexpected and sudden passing away of Mr Joseph Pararajasingham, the TNA MP for Batticaloa. He was murdered in the cathedral immediately after receiving Holy Communion from the hands of the Bishop of Trinco-Batticaloa, Dr Kingsley Swampillia, during the midnight Christmas Service. This violence is unjustifiable. This is unacceptable to men of good-will. Perpetrators of this inhuman act will, one day, stand trial in the presence of the creator. "Born in 1934, Mr Joseph Pararajasingham commenced his public life as a journalist and been a member of Parliament since 1990. In 1994 and 2000, he drew the largest majority votes in the north-east, proving the most popular and best served member. "Proficient in English, he was chosen to serve on prestigious boards in the Commonwealth Parliamentary Groups and on the SARC Committees. "He served the public as well as the church to the best of his ability. During the Jubilee celebrations of the Trinco-Batticaloa Catholic church, his contribution was immeasurable. He was very close to the Bishop in the dioceses, in advancing the interests of the church. 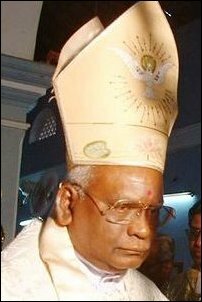 He was very helpful and articulate in assisting the Bishops’ Council of Sri Lanka, by expressing his solidarity, joining other Catholic memebrs of Parliament in protecting the interests of the church. "We are sure his soul will be rewarded by Almighty God for all the merits he has accrued by living a true and exemplary Christian life and for dedicating his life for the welfare and emancipation of the Tamil people. "We offer our prayers and express our deepest sympathies to the bereaved family. May his soul rest in God’s peace.